In my opinion, the best way to conduct gold futures trading is with a long term approach. I will demonstrate a daily and a weekly gold prices chart showing a few gold trading opportunities that occurred in the past, and a gold trading opportunity that I believe is coming up very soon. The following charts will show gold prices on both weekly and daily trading charts, and both charts will be for the December contract of gold futures. However, the trade I am planning to enter will be using the June 2013 contract. The price charts for both contracts are almost identical. On Friday (Oct 26), prices for both contracts closed within 6 points of each other. What is described in the following paragraph is essential a long-term trading system for swing trading gold. Although this post is anticipatory of an upcoming trade and is being posted in the futures blog section of the site, I am also adding it to the trading strategies section as it is a good description of what a long term swing trading gold system would looks like. This system can be duplicated for other long-term trending futures, and can surely be re-used should gold continue on an extended upward dynamic. One thing I must mention is that on the weekly chart, for which I used Ninja Trader futures charts and futures trading platform, there appears to be a "gap up". This is false, it is just a glitch in the online trading platforms. I don't know why this happens, and I did try to fix it but failed. The only real problem that it causes is that the moving average (blue line) on the weekly chart is about 25 points short of where it should be. The weekly moving average on the weekly chart is showing a value of about 1643, when it should be showing a value of about 1665-1670. The "gap" represents about one month (4 bars) of trading activity. The daily chart, using a different futures trading platform does not reflect this glitch at all. Now, lets get down to business and observe the weekly chart for gold prices using the December gold futures trading contract. First, notice the yellow circle on the left hand side of the chart. This was a "correction" period that occurred during late 2008. This was occurring right around the time when that big huge global financial disaster was becoming reality. The one where Lehman brothers and all those big shots went broke and screwed the world over because of their extensive debt derivative scams. Anyways, the point is, there was a period when gold was in a correction phase and spend several months trading below the moving average that I have set for this time frame. We have recently just seen a very similar correction take place. A correction that I believe has been run through to its conclusion. 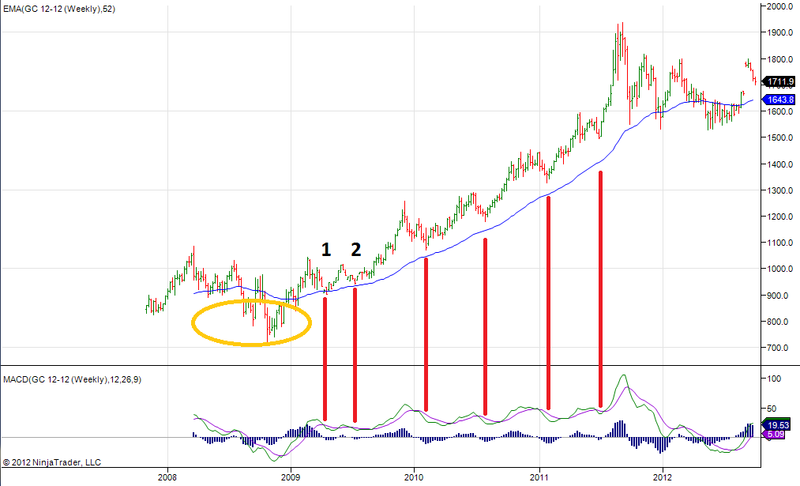 As you can see on the right hand side of this weekly chart, gold prices have spent the better part of the 2nd half of 2012 below the moving average. If you look back at some of my posts from spring and summer, you'll see I wrote about this quite a bit. We then see prices sharply broke out above the moving average (remember the 4 bar gap is a glitch). What I am focusing on in this time frame, is that over the past five years, gold has always demonstrated value when it dives to somewhere near the blue line moving average. In the case of examples 1 & 2 (marked 1 and 2 on the chart), prices actually did touch the moving average. In later examples, the only approached as bullish sentiment was too high to let it go any lower. What does this tell me? It tells me that I need to keep an eye on that moving average. I am willing to bet that, because this is similar to event 1 in that it is immediately following the correction, gold prices will touch that moving average. (Bear in mind the moving average should be up 25 points due to the glitch). The second thing that I am looking at, is that every time the price showed value, MACD was negative. I don't mean that it was necessarily below the zero line. What I mean is that the difference line was below the trigger line. This results in a negative MACD histogram reading. What are my conclusions from having read the weekly chart for gold as they relate to gold futures trading? Well, I conclude that I should wait for gold prices to reach the moving average that I have set on the weekly chart. Also, I should wait to see a negative reading on MACD histogram. All after having witnessed to breakout above the weekly moving average following the corrective phase we have witnessed over much of 2012. What I am describing here is essentially a long term weekly chart based swing trading strategy. Let us now examine the daily price chart for the December gold futures trading contract. What I need to see here, as we approach our target using the weekly tools, is a lower MACD reading and a move below the moving average (blue line). 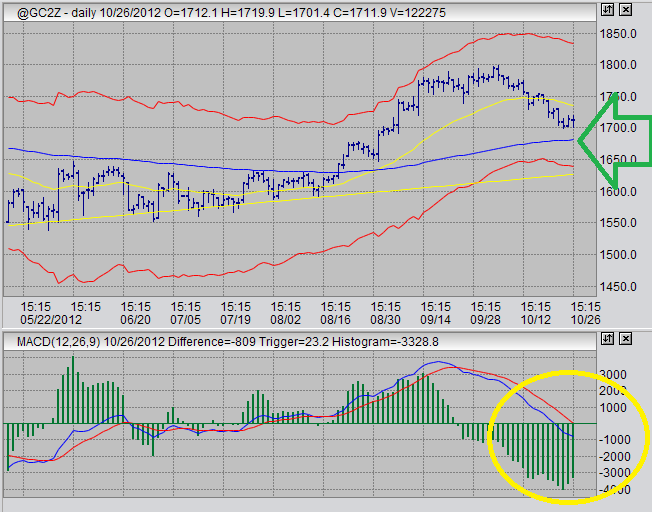 When this occurs, I will have my buy signal and I will be looking for an MACD divergence on the 60 minute trading chart. The blue line moving I have set on this daily chart is almost the same as the moving average I have set on the weekly chart. I expect prices to move below this line on the daily chart. The way the chart is looking now, it appears like we might get an MACD divergence occurring on the daily time frame with the histogram only. Overall, I am quite bullish on gold for the long term. I am waiting for my entry signal, as I have described above to materialize my long position. I am anticipating this to occur before the new year. This is the basis of my trading system for swing trading gold on a long term time frame.